We made these yummy guys for breakfast the other day. Found the recipe here via Pamplemousse1983. Super easy and super cute. Preheat oven to 375 degrees. Lightly butter 6 standard muffin cups. Flatten bread slices slightly and remove the crusts. Cut each slice in half, then press 2 halves into each muffin cup, overlapping slightly and making sure bread comes up to edge of cup. Use extra bread to patch any gaps. Brush bread with remaining butter. In a large skillet (or microwave), cook bacon over medium, until almost crisp, 4 minutes, flipping once. (It will continue to cook in the oven.) 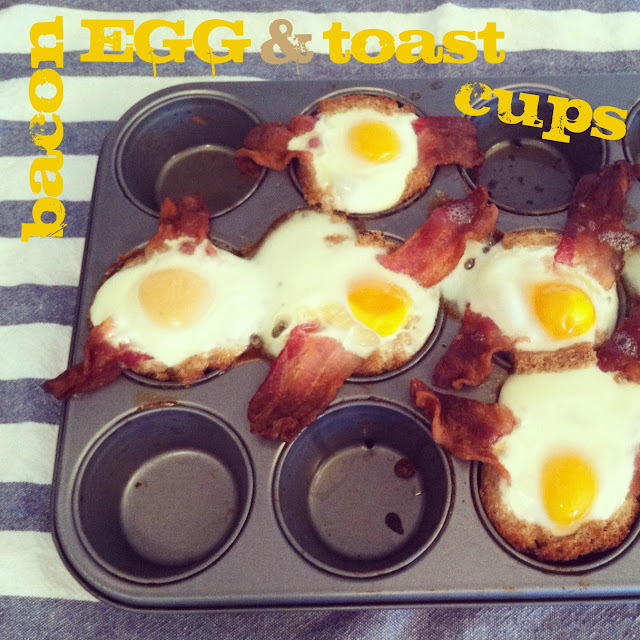 Lay 1 bacon slice in each bread cup and crack an egg over each. Season with salt and pepper. Bake until egg whites are just set, about 20 minutes. Run a small knife around cups to loosen toasts. Serve immediately. Personal Note: Next time I'm going to try puff pastry instead of bread for more of a light, fluffy crisp. YUMMY!! I think we'll make these this week. Love having your blog back!! This looks so yummy I might give it a try! Oooooo, I'm a veg, but this is such a fun idea ...I may try to sub fake bacon or veggie sausage and see what happens! Fingers crossed! Bacon makes everything tastes better! !